The General Store, Part 3: Let Me Out of Here! According to the Bible, once every seven years a sabbatical year is proclaimed. At that time the land lies fallow and renews itself. Roger and Jane Daby represented a variation on the sabbatical year. Every seven years they put the general store up for sale. If the store was sold they would take a permanent sabbatical and rest from being the dedicated owners of a Brant Lake establishment where they worked from 7 AM to 7 PM. Although they loved the store and Daby’s General Store was a part of them––still, this was not an easy life. 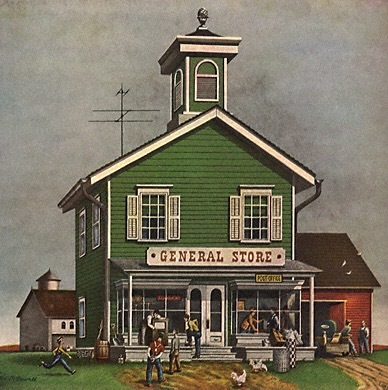 However, the seventh year always came and went, the store did not sell and each morning, at 7 AM, Roger also came and went, greeting customers with a smile partially covered by a beard slowly turning gray.On my morning jaunts into town I occasionally toyed with the idea of owning a general store, always ready to supply customers with a number 6 hook for fishing, a bungee cord, a coal bucket, pickles, crackers, potatoes, etc., etc., and so forth. This would be an opportunity for me to live in the past, or at least imagine that I was living in the past. I would be there to meet the stagecoach delivering the weekly mail, tack up notices: “Sheep Shearing At The Washington County Fair.” Somewhere in the back room I would can tomatoes, (although I do not know how to can), and in a shed I would shoe horses, (although I am incapable of even pounding a nail into the wall). The cracker barrel would overflow and I might even stock camphor mixed with goose grease, (the perfect remedy for congestion), a jar of castor oil, herbal medicines from the Mohican Indians who once roamed the land. I would relive a bygone era. Do you ever feel that way? I have one box left!